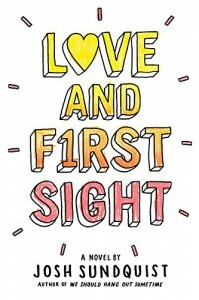 Love and First Sight is the first I’ve read by author Josh Sundquist. I read it in less than a day because I just couldn’t put it down. It is a gripping story with fabulous characters and an even ore fabulous story. So much of YA fiction focuses on girls so I was happy to read this novel, one that focuses on a guy. Will is not your average teenage guy, either. He is blind and has spent most of his life sheltered from the visual world. He has always gone to a school for the blind, and much to his mother’s distress, he has chosen to spread his wings and prove to her that he can thrive in the rest of the world, too. The descriptions of the world as Will “sees” it are vivid and they only become more vivid after Will undergoes surgery. The author really captures his journey and all of the emotionally charged aspects of it. The emotional side of it all is something I never would have considered before reading Will’s story and it really was eye-opening. The story is a wonderful blend of humor, stark reality, and adult choices. It is as much a story of friendship as it is one of growth and coming of age. It is also a story that makes you think. Being in Will’s head makes you, as a person with sight, see the world in a different way. It made me reconsider friendship and honesty and how differently even non-vision-related issues can be experienced by someone without sight. And as Will goes through the experience of having to make a potentially life-altering decision, it made me think about all the implications of that kind of choice. Choices that seem like easy ones on the surface, but really aren’t. I enjoy a book that forces me to take another look at life and see it from an entirely different perspective. This is a great read that will make you think. The story is incredibly engaging and it is one that I won’t forget for a long time. This is a book I highly recommend!